Back in the day, when I was little, Glowworms were all the rage. Okay, so maybe that's a slight exaggeration but my love of the Glowworms isn't. And I didn't just have one Glowworm, I had three. And even now, as an almost-thirty-one-year-old, I still have one left. Side Story: When I was in 2nd year of university, my Mum and I drove from Toronto to Fredericton for the start of the school year. Obviously, Glowy 3 came with me (they all had the same name, with numbers afterward--for a creative child, I'm just as surprised as you are with my lack of thinking outside the box). On the third day of our drive, disaster struck: I left Glowy 3 (the sole remaining Glowy) at a hotel. Luckily, the hotel employee found my Glowy, packed him up (with Styrofoam eggies) and mailed him to me. He arrived unscathed and has been hanging out with me ever since. Me and Glowy 3. I took some liberties with the overall design, adding a few rows of sequin trim because, you know, every gal needs a little sparkle. And it was a totally unexpected bonus to find the shoes and leggings. 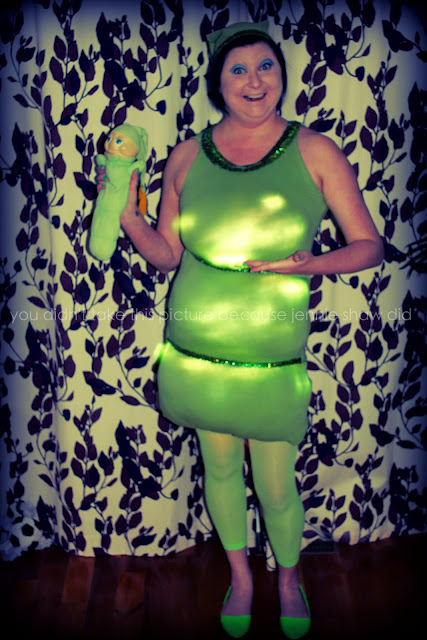 Obviously, if I was going to be a Glowworm, I needed to glow. So, off to eBay I went, in search of LED Christmas lights that ran on battery packs (have I ever talked about my love for eBay? It's the BEST!). Like looking in a mirror, right? And let me tell you, covering up my eyebrows was no easy task. I watched a tutorial on Google but it wasn't nearly as easy as the guy in drag made it seem. *shakes fist* Still, it worked out pretty well. And just when the night was getting started, a terribly scary clown tried to kill me. Probably because she was jealous of my costume's awesomeness. Stupid clown...(I kid, I kid). Happy Halloween, everyone! Be safe when you're out with your kiddies tonight! Pure amazingness!!!! Also the same sorta thing happened with my stuffed seal, known as wet willie since I did not see anything wrong with that at 3, and the hotel also sent him to me in the mail! Totally awesome! I love it. I had glowworms as a kid too. 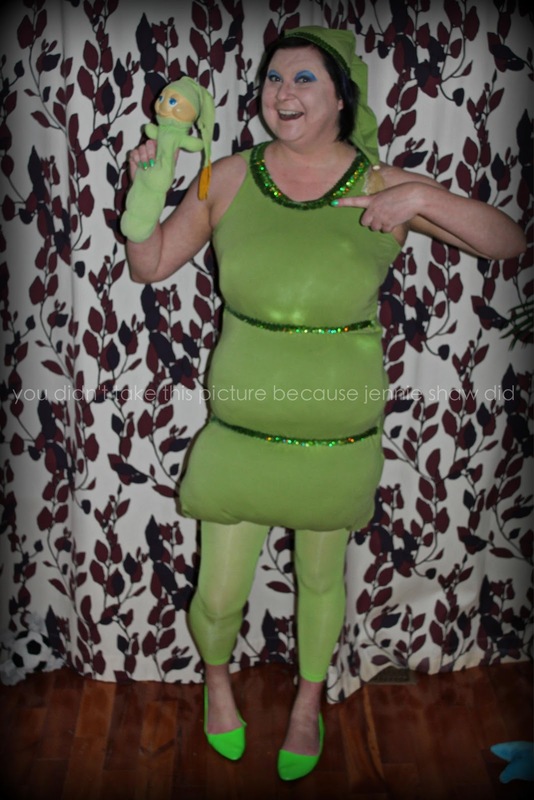 Great costume, looks like a fun party! I lost my "fweetie" (sweetie) doll at Disney World once. I was devastated too...however, I was 3 ;) But I would have been sad to lose one of my stuffed animals while in university too. I had many. This is HILARIOUS! You have some mad costume making skills. I'm not creative at all...I went as a black cat this year. Original, right? ;) Happy Halloween! What a great idea! 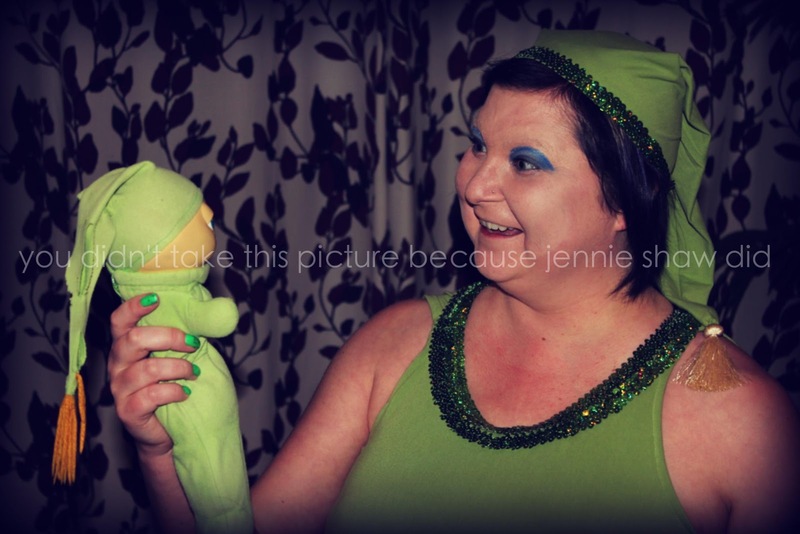 I had a glow worm as a child, maybe every child had a glow worm. 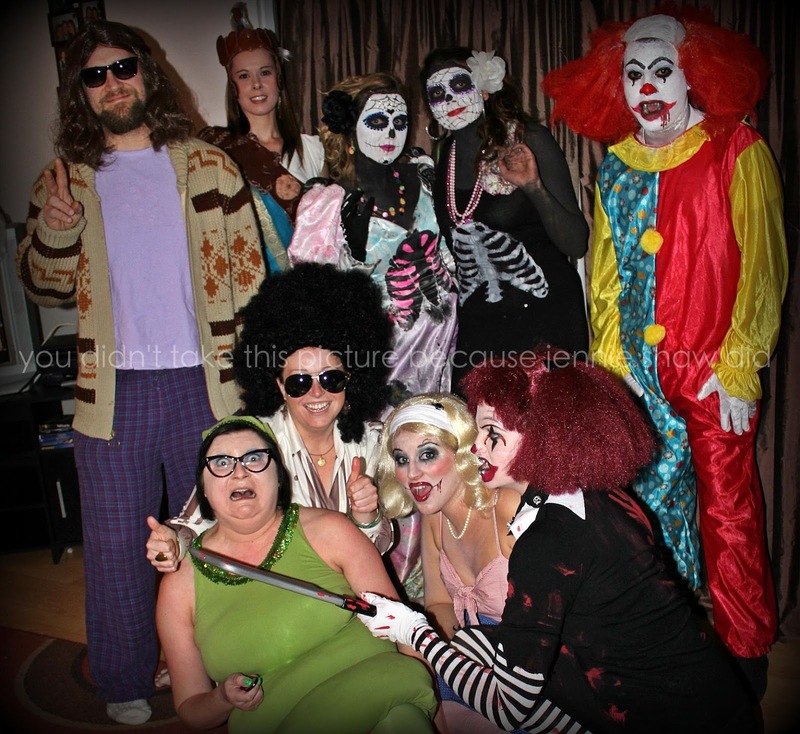 Your costume turned out great and that last picture, you guys look like you have lots of fun! OHMYGOD. this is absolutely incredible!!! Oh my gosh! When I was little every single one of my dolls was named "Vanessa". NO IDEA WHY! I looooove your costume. Absolutely amazing! What did you use for your dress?